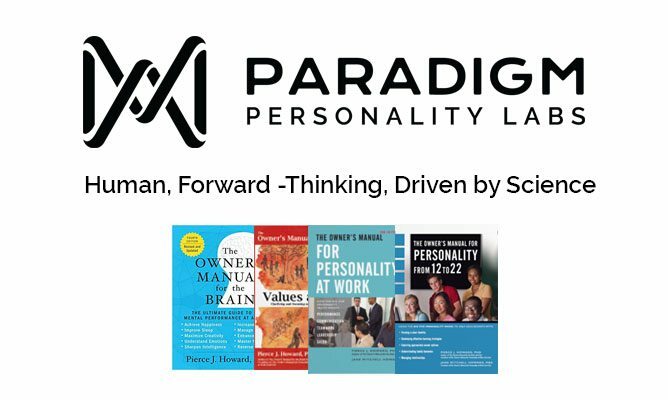 Paradigm Personality Labs is all about understanding individual differences in the workplace. Our approach is innovative, comprehensive, informative and people-centered. We believe that understanding individual personality can unlock the paths to achieving individual and organizational goals. Paradigm is built upon decades of personality research and consulting experience. We leverage this knowledge and experience to understand people, and to honor their complexity, individuality and personal strengths. Individuals’ personalities, motivators and drivers affect the work environment in many ways, and our assessments make them easy to understand. Each test-taker get results that reveal their unique capacities—individuality that we believe is beautiful. And the results are in clear, concise, workplace-oriented language. We are evolving, even as we use our current products to help individuals, teams and organizations develop their own capacity. We conduct research and apply new ideas on an ongoing basis. We continually develop new assessments and other tools—it’s in our personality to grow. Our WorkPlace Big Five Profile™ suite of products provide powerful insights that are grounded in science and focused on outcomes that businesses and other organizations need to succeed in a rapidly evolving world. And we are here to help. Our customer service is unparalleled. Our in-house experts share best practices to help design interventions so that you can confidently use the WorkPlace suite to achieve your goals.